These Orange Cream Truffles are super good! The other day, a reader of mine asked if I had any chocolate recipes with orange cream. I didn’t at the time, but I loved the sound of a dessert like that. That is how these orange cream truffles were born. If you like my strawberry creme truffles, then you will love these orange cream truffles! It’s like a bite sized creamsicle covered in chocolate. How yummy is that? I think these truffles would be great without the chocolate too. 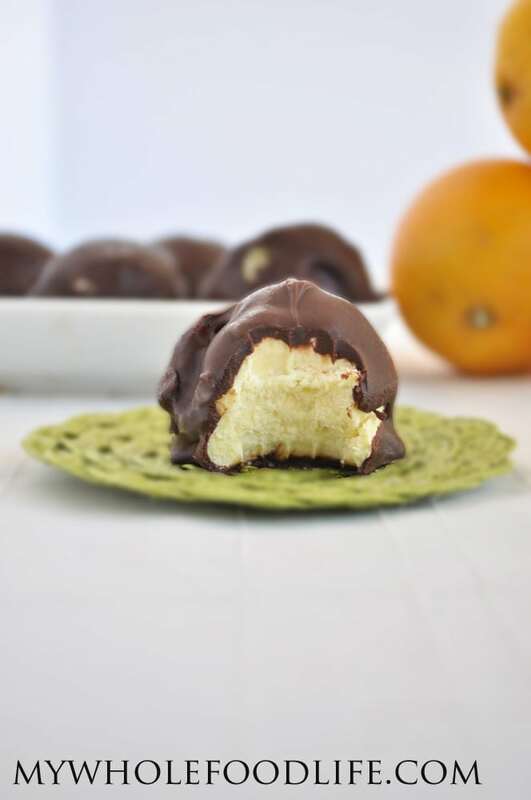 These orange cream truffles are super easy to make. All you need is 6 simple ingredients! These truffles are vegan, gluten free and paleo. They would be a great dessert to take to any party. No one would have any idea they were made a little healthier. I honestly think if you used super sweet oranges, you could eliminate the maple syrup all together. You could also use my 3 ingredient chocolate recipe instead of chocolate chips! A chocolate truffle with a creamy orange center! In a food processor , combine the filling ingredients and blend well. You want to try and get all the orange chunks out. It may take a couple minutes. Once everything is combined, place the mixture in the freezer for about 10 minutes. It needs to slightly firm up so it can be scooped into balls. Once the mixture is firm, form the balls. I used a cookie scoop to form mine. Place balls on a lined baking sheet and stick in the freezer for at least 30 minutes. Using a double boiler method, melt the chocolate chips and almond milk together. Stir almost constantly until it's smooth. Using 2 forks, roll each orange ball into the chocolate and coat it completely. Place the balls back into the lined baking sheet. Once all the balls are coated in chocolate, stick them back in the freezer for an hour. Keep these these truffles in the freezer. They will last several months. Enjoy! Most definitely trying these! Wondering if you ever plan to try a pumpkin truffle? I know you love pumpkin :) I would love to see a recipe for that! What kind of oranges did you use for this recipe? Also is coconut oil an acceptable substitute for coconut butter? I used navel oranges. I'm sorry coconut oil will not work. It will harden too much. Hello. I am wanting to try this recipe..... have a life-changing diet I have to abide by now. I want to make sure... when you say "coconut butter", you mean the crisco-looking texture (solidified coconut oil), right? Some recipes give surety on this. I just want to be sure. Thanks so much. Is there something else that can sub for the coconut butter?